Summary: Mobile apps - including banking apps - are more at risk now than ever before. A Verizon report provides details on the types of risks and the practices recommended to protect your bank. We aren't dieticians, but found it certainly interesting that research finds you burn more calories eating celery than it contains. After all, it only has 6 calories and is about 95% water. 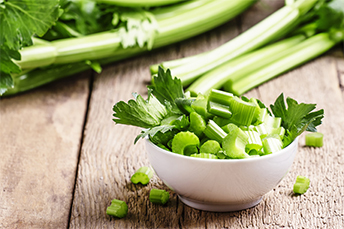 The good news is that one cup of celery gives you about 30% of the recommended daily intake of Vitamin K, which plays a key role in helping blood to clot and assisting in absorption of calcium from food. Of note, celery is part of the parsley family, which also includes carrots and cumin. While certainly not as good for you as the crunch of a good stalk of celery, bankers are also getting crunched by mobile security cyber incidents. Almost 33% of respondents admit to having sacrificed mobile security to improve expediency and/or business performance. Of those, 38% say their organization is at significant risk from mobile threats. Further, 25% said that during the past year their company had experienced a security incident resulting in data loss or system downtime where mobile devices played a key role. Denial of service: Jamming of wireless communications, overloading networks with bogus traffic, ransomware, or loss/theft of device. Geolocation: Gathering data on location, infringing on the privacy of the individual. Information disclosure: Interception of data in transit, leakage or exfiltration of user, app or enterprise data, eavesdropping on voice or data communications, surreptitiously activating the phone's microphone or camera to spy on the user. Spoofing: Email or text message pretending to be from a boss or colleague, fraudulent Wi-Fi access point, or cellular base station that mimics a legitimate one. Tampering: Modifying data in transit, inserting tampered hardware or software into supply chain, repackaging legitimate app with malware, modifying network or device configuration (such as "jailbreaking" or "rooting" a phone). Apps: Reduce the risk of malicious and vulnerable applications by looking into creating a custom app store and vetting all apps that are added to it. Segmentation: Improve device management by automating it as much as possible. This includes deploying mobile endpoint security/threat detection and implementing device segmentation, keeping personal and work data and applications separate. Ambassadors: Train "security ambassadors" within the bank to act as champions for improved mobile security. As mobile adoption continues, banks should continue to monitor changes to keep up. Having the right practices and processes in place, and refining them along the way, will ensure your bank and your customers remain well protected and less crunched by mobile cyber incidents. To optimize the customer experience and reduce sales costs, real estate companies and banks are working together in leveraging augmented reality (AR) and virtual reality (VR) tools. Real estate companies and banks are partnering on home buying solutions, including apps with "home finder", a virtual 360 degree home tour and loan information that is processed using artificial intelligence (AI). The Fed reports that CRE loans increased by $26.4B in Q1 to $2.1T, yet the 25 largest banks saw their CRE loan exposure drop an annualized 1% approximately in Q1. These banks currently carry just over 33% of all CRE loans. Together, all other banks increased their CRE loans by an annualized 7% during Q1. A group of payments experts at a recent event said blockchain technology and digital currencies will have an impact on how central banks operate worldwide, but said the risk of a decentralized system will slow adoption for many years and perhaps longer. A JP Morgan survey of the so-called ultra-rich, with more than $30mm in liquid financial assets, finds 75% expect a US economic downturn in the next 2Ys. About 50% expect it in 2020 while 21% believe it will come in 2019.